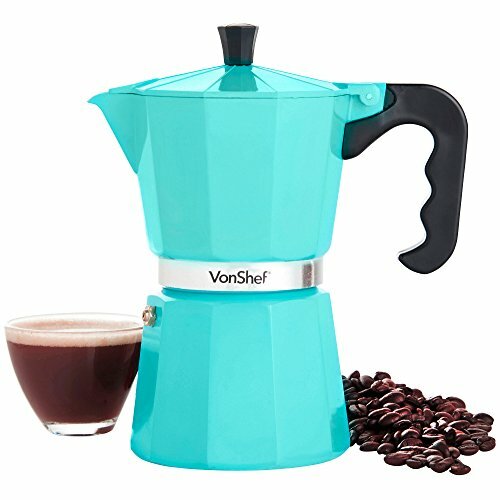 Discover the art of making your own authentic espresso coffee with the VonShef 6 Cup (300ml) Espresso Maker. What’s the secret? The VonShef Macchinetta draws water from its base through a funnel filter, where it’s infused with the ground coffee before moving up to the top of the appliance where it’s ready to be collected. Discover the art of making your own authentic espresso coffee with the VonShef 6 Cup (300ml) Espresso Maker. The VonShef Macchinetta draws water from its base through a funnel filter, where it’s infused with the ground coffee before moving up to the top of the appliance where it’s ready to be collected. The result? A full-bodied coffee which is perfect for getting your day off to a good start or beating the dreaded mid-afternoon slump. Once you’ve indulged in espresso made with the VonShef Espresso Maker, you’ll never revert back to conventional coffee making methods! Premium quality aluminium construction with a hinged lid, cool touch handle and knob and temperature resistant silicone gasket. Suitable for use on both gas and electric hobs. Please note these are not suitable for induction hobs. Comes complete with replacement gasket and filter. Easy to clean – hand wash only. Super item. Love the colour. Very stylish and well-made. Makes one cup of delicious coffee. Not five stars as you have to prise the coffee grounds holder out with your fingernail. Very fiddly. Iron plate placed under Macchinetts effectively makes it usable on induction hub!